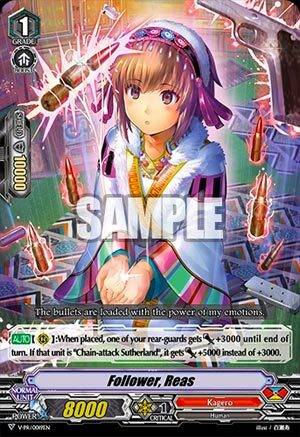 [AUTO](RC):When placed, one of your other rear-guards gets [Power]+3000 until end of turn. If that unit is “Chain-attack Sutherland”, it gets [Power]+5000 instead of +3000. I wouldn’t have minded, if Sutherland was actually good. But sadly, he isn’t. If you want columns just get Dragon Armored Knight to fill that void. You don’t draw that much in Kagero and there’s no way to search either piece: Reas or Sutherland. Not worth being vanilla the rest of the time.